After the induction of general anesthesia, a retrograde pyelogram is often performed to confirm the diagnosis and define the anatomy. If desired, an internal ureteral stent may be placed at that time, and an indwelling Foley catheter is placed to gravity drainage. Our Anderson-Hynes dismembered pyeloplasty technique is similar to other previously described methods (25-29). The da Vinci Surgical System consists of two interactive robotic arms, a camera arm, a three-dimensional imaging system, and a virtual control chamber. The patient is placed in a lateral or semilateral decubitus position and three laparoscopic ports, including two 8 mm ports and one 12 mm disposable port, are placed in a "c" configuration (Fig. 1). The beginning portion of the operation is performed as a standard transperitoneal laparoscopic approach by gaining access with a Veress needle or Hasson technique. Some institutions have performed this beginning portion entirely with the robot. Noteworthily, there are reports in the adult literature describing a retroperitoneal approach to the laparoscopic pyeloplasty but not as a robotic-assisted pyeloplasty (30-32). On the left side, the descending colon is displaced medially in order to gain access to the ureteropelvic junction. On the right side, the peritoneum is incised from the liver attachments down to the iliac vessels and parallel to the ascending colon, allowing identification of the ureteropelvic junction between the lower pole of the kidney and the inferior vena cava. The ureter and renal pelvis are also completely mobilized. Extensive dissection of the proximal ureter is avoided to maintain the vascular supply to the ureter and ureteropelvic junction. Once the diseased ureteropelvic junction and/or crossing vessel are identified, the da Vinci robot is docked into place. Depending on surgeon preference, the camera consisting of a 0° or 30° lens is placed through the disposable 12-mm port at the umbilicus. The robot arms are each placed through the two reusable 8-mm ports. At this time, a fourth port is placed in the lower infraumbilical area in a position contralateral to the operative side. Some surgeons prefer to place this fourth port at the time of the initial port placements. A 12-mm disposable port allows the assisting surgeon to introduce and retrieve sutures, aid in retraction, and perform suctioning. Robotic instruments employed include needle drivers, forceps, and scissors. 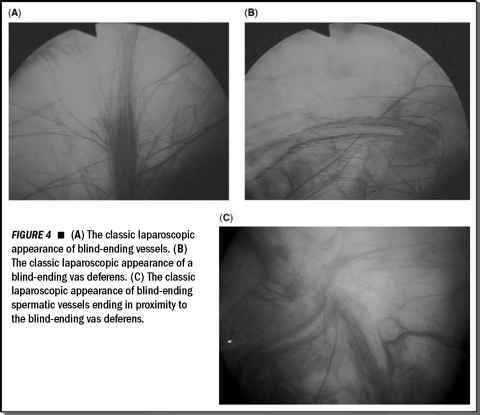 FIGURE 1 ■ Trocar positioning for left robotic-assisted laparoscopic Anderson-Hynes-dismembered pyeloplasty in an adult patient. Four laparoscopic ports (two 8 mm ports and two 12 mm disposable ports) are placed in a "c" configuration with one contralateral port. The mirror image is done for a right-sided procedure. Nondismembered pyeloplasty may be performed for appropriately selected patients using robotic assistance. In some of our earlier cases, the indwelling stent was placed prior to surgery but we believe that this made the transection and repair of the ureteropelvic junction more difficult. In performing Anderson-Hynes dismembered pyeloplasty, the renal pelvis is circumferentially transected above the ureteropelvic junction (Fig. 2A and B), and the proximal ureter is spatu-lated laterally. Some earlier cases were performed using laparoscopic endoshears. At this time, the current preference is to spatulate the ureter using potts scissors. In the case of crossing vessels, the ureter and renal pelvis are transposed to the anterior side of the vessel prior to initiation of the anastomosis (Fig. 2C). If the renal pelvis is redundant, excess tissue is excised. An absorbable 4-0 suture is placed through the apex of the spatulated ureter and at the most dependent portion of the renal pelvis. The posterior anastomosis is then performed with an interrupted or running suture. If redundant pelvis tissue was excised, the remaining pyelotomy incision is closed using additional sutures. If an indwelling stent was not placed at the beginning of the procedure, it is placed into the ureter over a guidewire and under direct vision at this time. The wire can be passed through the abdominal wall using a 14-gauge angiocatheter or the assistant may pass it through the 12-mm accessory port. The distal coil is positioned within the bladder, and the proximal coil is positioned within the renal pelvis. With experience, the distal portion of the stent is easily manipulated into the bladder, but methylene blue dye can be placed in the bladder to confirm positioning of the stent. Alternatively, fluoroscopy may be used to visualize the distal portion of the curled stent in the bladder. The anterior anastomosis is then completed (Fig. 2D). Following a watertight anastomosis, a drain is placed and then exits the patient via one of the laparoscopic 8-mm ports. Patients are scheduled for follow-up at four to six weeks for stent removal. A diuretic renal scan is performed at three months and annually thereafter. Clinical follow-up is scheduled annually. Success is defined as improvement of symptoms related to the previous renal obstruction and improved function on diuretic renal scan. Different methods of nondismembered repairs have been described in the laparo-scopic pyeloplasty literature such as Culp-DeWeerd spiral flap (33), Fenger plasty (34), Y-V plasty (Fig. 3) (18), Heineke-Mikulicz repair (19), and Davis-intubated ureterotomy (19). The ureteropelvic junction incision and suturing in these repairs are performed in a similar manner as in the open operative intervention. 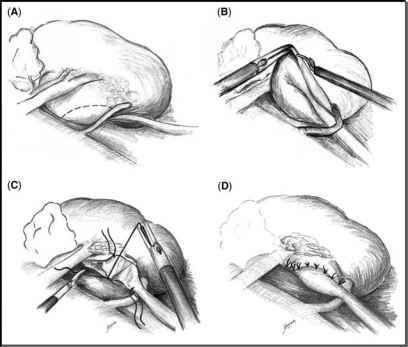 FIGURE2 ■ Anderson-Hynes dismembered pyeloplasty is the procedure of choice for robotic-assisted cases. (A) Dissection of the proximal ureter and ureteropelvic junction reveals a crossing vessel. (B) Incision of the renal pelvis and transposition of the crossing vessel. (C) After spatulation of the ureter laterally, a posterior anastomosis is performed with running or interrupted sutures. (D) A tension-free, water-tight repair is achieved with an internal stent previously placed (not shown).